Blisters are a common ailment that almost everyone has suffered from. They’re usually caused by friction: the back of a foot rubbing against new shoes; the sensitive area between toes chafing against summer thongs. Most blisters don’t require medical attention. New skin forms beneath the affected area and the fluid built up in the blister is simply absorbed back into the tissue. Vitamin E ointment or an aloe-based cream can soothe ordinary blisters. The specialists at Cherrywood Foot Care recommend that you don’t puncture a blister unless it is large, painful, or likely to be further irritated. If you believe it’s necessary to pop a blister, use a sterilized needle or razor blade. Wash the area thoroughly, then make a modest hole. Gently squeeze out the clear fluid and apply a dab of hydrogen peroxide to help protect against infection. Be careful not to remove the skin over a broken blister; the new skin underneath needs this protective cover. Cover the area with a bandage and gently compress. Warning: If the fluid is white or yellow, the blister is infected and needs medical attention. Please come see us at Cherrywood Foot Care and we’ll help to heal this problem before it becomes a more serious medical issue. Prevent blisters by breaking in new shoes gradually. 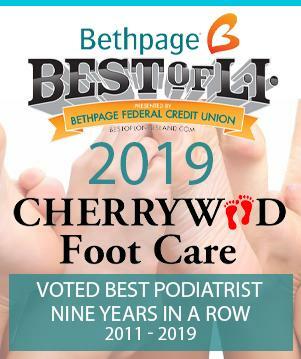 At Cherrywood Foot Care, we suggest you put petroleum jelly or an adhesive bandage on the areas that take the rub—before the blister happens. Wear socks that have heels instead of tube socks (they bunch up and cause blisters). Acrylic and other synthetic-fiber socks are good choices. Be sure to wash and dry your feet daily to prevent bacterial infections, such as Athlete’s foot.